Binary-options-and-Indicators I have decided to share another tutorial that I previously shared on the BOD forum. 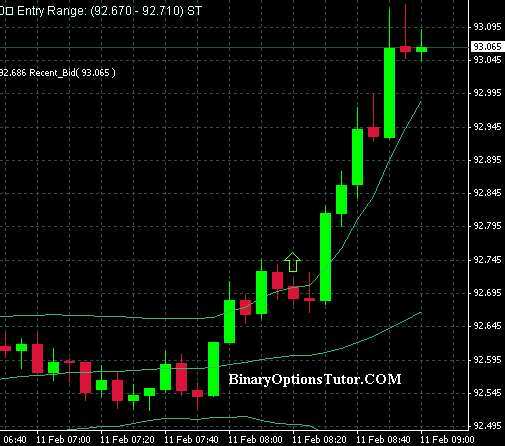 This Binary Options Tutorial is all about using indicicators along with Binary options. I do a small fast Nadex bet and take you through a quick 20 minute trade using a chart with RSI and Bollinger bands as indicators to illustrate our views on popular indicators and how we fit them into our trading plans. IMO I have a somewhat different way of looking at indicators and if you find them confusing or unrewarding on your binary options trades then this different perspective might help you. OK before we get to charts and trades and bears OH MY lets get a few things straight. Friends Romans countrymen I come not to bury indicators but to praise them When they are in their proper place in the process of planing a trade. Firstly anyone with the patience of job that made it through that other post knows that I like to look at the bigger picture stuff and plan around the people in the markets. So I mentioned that USDYEN call trade guys are so fond of and I did say that I had been taking some puts but still felt the market really wants to go up and that CALL trade still has institutional traders and investors behind it. So I got no problem following the money taking calls. Before I got a signal the first there was a plan and a perception of where this currency was in my mind. So I got a call and this is where indicators come in to my game. Indicators can help me be Objective and consistent and INDICATE to me when the markets are in line with the plan I already had. I am sure you have heard the trend is your friend well think about it how many friends do you have that disagree with everything you have to say and just argue with you all the time. You probably got no friends at all like that if you think about it and the trend is the best friend you can have on the market so I use indicators to indicate to me when me and my friend are seeing eye to eye. What I am getting at is indicators are best used to indicate something and that is there name somewhere along the way marketing and liers and people with no F'n idea of what they are talking about started everyone thinking traders can use indicators to PREDICT the markets.When you put indis in their proper place and use them properly as just indicators there is a lot less confusion and they are a lot more useful for their original intent. That is it my strange and demented way of looking at indicators is just to use them as indicators. OK lets do some little trades and look at a signal. For the purposes of the trade I am about to show you I would like to focus on just RSI and the Bollinger Bands you can see on my chart. At some point yes we might do a signal service done one back in the day but I will talk to David before I mention anything more about that and we still got some work to do on what we want to offer this time around. You don't want to pay for signals cool, that is one of the reasons I am sharing my views for free. So many guys want to see ITM percentage but IMO the more telling sign is how the guys behind the signals plan & trade. OK off my soapbox with that topic. The signal was a Soft call USDYEN the suggested entry range was 92.67 through 92.71 and of course on a call I want to get in as low as I can so I would shoot for 92.67 or lower if I were at an offshore broker. That signal is based on a strategy for 45 minutes but I went into a demo on Nadex just because Botz might read this and I know how he loves that platform LOL and I done some trades 20 minutes in and out. 92.71 or higher offshore then No problem I will catch the next ride. Now how is this indicator most commonly used? It is used most commonly to predict when a market is overbought or oversold. The problem is that this is better used as an indicator in my opinion. Conventional wisdom will say that if RSI is above 70 the market is overbought or if it below 30 the market is oversold. there are a few people who use it differently more like how I view it. and when RSI is above 60 it is indicating we are in a BULL Market. Lets touch on something else here some people use RSI or MISUSE it in my opinion trying to predict when a market is crossing over into being bullish by watching RSI cross 50. There are 100 numbers here and they are indexed into sets of 10 that is where the name comes from so if I owe you $100 and pay you $50 how confident would you as a human being ( because that is what the market is made up of ) be that I am going to pay you the entire $100? Now if I owed you $100 and paid you $60 might that make you feel a bit more confident that I am going to pay you the $100 I owe you? Trading does not have to be so complex if you look at it in a simple fashion IMO. So now that you know these numbers you can see RSI was indicating $58.47 of the $100 owed had been paid back to you and we are INDICATING being right at a BULLISH MARKET. I am about to do a Binary options Call so that sounds good my friend the trend agrees with me there. OK lets get the usual stuff out the way. John Bollinger came up with this tool at some point in the 1980s so it is relatively new. This indicator just shows a band around the prices based on the previous numbers the asset was traded at. I like to use this indicator like this, after you have seen the bands tighten that tells you the market is consolidating (sleeping ). When a human is not sleeping what are they? Awake, so there's nothing complicated there at all see, if you just use it as an indicator. When you load these on MT4 you will find them under trend because they are another great indicator to put on and look at an illustration of where the trend has been going. You can see the bands were tight ( market consolidating or asleep ) so you know it is going to wake up and go either up or down and that is not a prediction it is what you can really see based on what you are looking at on my pic above. Market woke up and started moving upwards and RSI said it was right at being bullish and the nice lady trader weeks ago said it was bullish and a HUGE company like Sony said they like the USDYEN bullish. Now am I a genius for just being observant and putting indicators in their proper place? NO, Really no one has to be IMO. OK this was just some trades I took based on the signal and sold fast for some profits. I got a call so I took an ITM trade that was above my strike price ( notice how it cost more and I am willing to buy more contracts ) and I got a trade Out the money because we were not quite there yet. Inside the 20 minutes I was holding these full day contracts the market went up and this resulted in a fast $50 after fees on this PAPER TRADE. I was just having fun and my net is up and down due to the storm in my area. Now if I would have done it on an offshore broker then I would have done a 45 min call and took whatever they were offering at the time ( 69 - 74% probably ). That is all for now and remember when Alfred is Talking Markets you can take it to the bank!